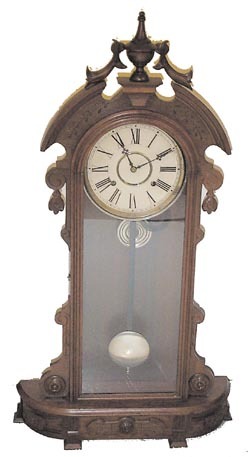 Waterbury Clock Co., tallest of the tall mantle clocks, "Galway", ca 1883. 36 1/2 inch walnut case has been refinished and polished. Now with a nice furniture finish. The metal is all polished, movement serviced recently. The dial was chipped and repaired around the arbors and inner dial. Numerals expertly touched up where repairs were made. Movement is 8 day, strikes a cathedral gong on the hours. Overall excellent refinished and restored clock. Ly-Waterbury No.1542.